Atmospheric aerosol particles and cloud droplets determine what fraction of solar radiation reaches the Earth’s surface and what fraction of it returns to space, thus reducing the warming potential of greenhouse gases. Aerosol particles exert a combination of effects on the global radiation budget. Thus, the magnitude of the impact of aerosols on temperature, clouds and precipitation is highly uncertain. This uncertainty limits our scientific ability to predict future surface temperature changes and to unambiguously detect an anthropogenic greenhouse-warming signal. Aerosol defined as liquids and particles are especially complex because their properties change with time. Atmospheric reactions occurring in the gas, particle and droplet phases alter the chemical and physical properties of aerosols, thus necessitating careful study [Ervens et al., 2011; Hallquist et al., 2009]. A schematic of the environmental and physical factors that affect the composition of atmospheric organic aerosol. Aerosol particles arise from a variety of emission sources and atmospheric processes. Up to 80% the aerosol mass is secondary and aged organic compounds [Hallquist et al., 2009]. 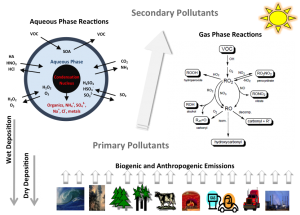 Oxidized biogenic and anthropogenic volatile organic compounds (VOC) form secondary organic aerosols (OA) via a complex array of low and intermediate volatility compounds and reaction mechanisms. Despite its abundance, isoprene oxidation was not expected to contribute to secondary OA because a majority of its oxidation products were too volatile to partition to OA. However, the observation of isoprene oxidation products in ambient aerosol collected in the Amazon by Claeys and colleagues [Claeys et al., 2004] prompted reconsideration. Kroll et al. designed a series of new experiments with longer experimental time and pre-existing seed aerosol and showed that isoprene oxidation can contribute to OA via further oxidation of the initial products and via heterogeneous reactions. The widespread presence of clouds in the lower atmosphere, the large fraction of aerosol water associated with ambient aerosol particles, and the water-solubility of the major fraction biogenic VOC oxidation products together motivate investigation of aqueous phase chemical reaction processes [Carlton et al., 2009; Ervens et al., 2011]. Water-soluble compounds participate in chemical reactions (oxidation, reduction and accretion) and transform biogenic VOC even further. The aqueous phase products have lower volatility and higher molecular weight than their precursors; thus they remain in the aerosol phase after water evaporation. Overall, a multitude of chemical reactions occurring in the gas phase, aqueous phase, or at the interface between two phases are responsible for secondary OA formation and the transformation of primary and secondary OA to aged OA. To understand the aerosol chemistry of isoprene oxidation products and demonstrate the new Michigan Tech Multiphase Reaction Chamber capabilities, we propose a novel multiphase study of the primary isoprene oxidation product methyl glyoxal in the presence of ammonium sulfate aqueous aerosol.